NASA's Cassini spacecraft, which has been orbiting Saturn since 2004, will begin a dramatic series of final orbits in late 2016, diving repeatedly between the planet's inner rings and its upper atmosphere to collect unprecedented data. 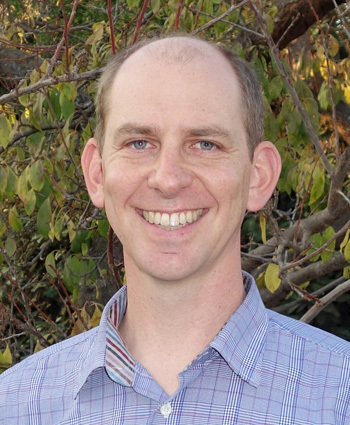 Jonathan Fortney, professor of astronomy and astrophysics at UC Santa Cruz, will be using that data to learn about the internal structure of the mysterious giant planet. Fortney is one of four new participating scientists NASA has chosen for the last phase of Cassini's highly successful mission to Saturn. 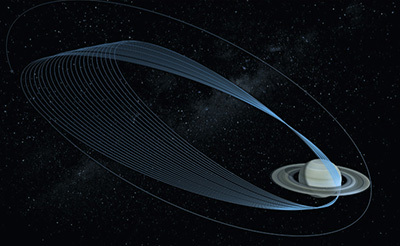 He said the data gathered during the spacecraft's final orbits will yield precise maps of the gravity and magnetic fields of the planet, giving scientists new insights into Saturn's interior structure and composition, including the mass of its deep core and the density of its outer layers. "We'll have a much better understanding of how the planet works," Fortney said. He noted that NASA's Juno mission to Jupiter, which will arrive at that planet in July, will also be gathering data on gravitational and magnetic fields, enabling a great opportunity to compare these two giant worlds. Saturn and Jupiter are both gas giants composed mostly of hydrogen and helium, with relatively small rocky cores. "We really don't know what their interiors are like," Fortney said. "What's great is that, in the space of a year, we'll have once-in-a-lifetime data sets for both Jupiter and Saturn." In addition to studying the planets in our own solar system, Fortney is interested in the structure and physics of planets orbiting other stars (exoplanets). He was a member of the science team for NASA's Kepler mission during its prime mission, which has discovered over 1,000 confirmed exoplanets and nearly 4,000 new candidates that have yet to be confirmed. Understanding the planets of our own solar system is important for scientists trying to make sense of new observations of distant exoplanets, he said. "The internal structure of planets touches on how they form and evolve over time. This is an important time for us to understand our own gas giants for comparison to exoplanets," Fortney said. As he prepares for the final stages of the Cassini mission, Fortney is also engaged in the initial planning for a possible future mission to Uranus or Neptune, or both. A mission to one of the two "ice giants" was among the top priorities identified by the National Research Council's most recent Planetary Science Decadal Survey. While NASA has not committed to flying such a mission, the agency does want to better define what it might look like. Fortney is one of 14 scientists chosen by NASA, including two from the European Space Agency, to serve on the Science Definition Team for an ice giants mission concept study. The team met recently at NASA's Jet Propulsion Laboratory in Pasadena, which is leading the study, to begin planning a strategy to maximize the scientific payoff from an ice giants mission. Fortney said there is a possibility for missions to go to both planets, although that constrains what can be done at either planet. The only previous mission to visit the ice giants was Voyager 2, which flew by Uranus in 1986 and Neptune in 1989. "The two planets look very much alike, but they are dramatically different in the amount of energy coming out of their interiors," Fortney said. "Neptune is ten times brighter than Uranus in the thermal radiation coming out of its interior. We don't know why, and we don't know which one is a better example for exoplanets in that size range. It's probably one of the biggest remaining science questions for the outer solar system." The launch window under consideration by the ice giants mission study is sometime between 2025 and 2037, and it would take about ten years for the spacecraft to reach Uranus. "It might get there and start sending back data around 2045, around the time that I'll be retiring," Fortney said. "It's a little bewildering, but at the same time very exciting to be thinking about that."